Constructs a new ViewEmail object with the given parent and name. 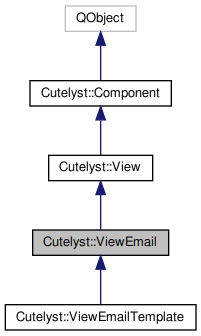 Constructs a new ViewEmail object using the private class, parent and name. ViewEmail is a Cutelyst::View handler that sends stash data via e-mail. Definition at line 31 of file viewemail.h. Definition at line 49 of file viewemail.h. Definition at line 40 of file viewemail.h. Returns the default charset for every MIME part with the content type text. Referenced by setDefaultContentType(), and ViewEmail(). Returns the default content type (mime type). Referenced by setStashKey(), and ViewEmail(). Referenced by setDefaultCharset(), and ViewEmail(). Definition at line 170 of file viewemail.cpp. Definition at line 134 of file viewemail.cpp. Definition at line 122 of file viewemail.cpp. Definition at line 98 of file viewemail.cpp. Definition at line 158 of file viewemail.cpp. Definition at line 110 of file viewemail.cpp. Definition at line 146 of file viewemail.cpp. Defines the default charset for every MIME part with the content type text. According to RFC2049 a MIME part without a charset should be treated as US-ASCII by the mail client. If the charset is not set it won't be set for all MIME parts without an overridden one. Definition at line 78 of file viewemail.cpp. Defines the default content type (mime type). Definition at line 65 of file viewemail.cpp. Definition at line 91 of file viewemail.cpp. Definition at line 140 of file viewemail.cpp. Definition at line 128 of file viewemail.cpp. Definition at line 104 of file viewemail.cpp. Definition at line 164 of file viewemail.cpp. Definition at line 116 of file viewemail.cpp. Definition at line 152 of file viewemail.cpp. Definition at line 52 of file viewemail.cpp.